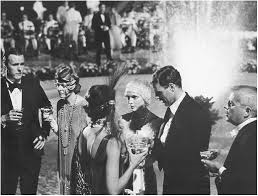 It’s been said that Jay Gatsby’s parties are enormous and extravagant. On Saturday nights in West Egg, this mansion fills up with people from all around. Champagne, dancing, and music play a huge roll in these parties. But what really makes Mr. Gatsby’s parties so unique? It’s Jay Gatsby himself. It’s the fact that there is a mysterious feature about him. All throughout his parties people are wondering just who he is. Rumors are spread from one person to another. 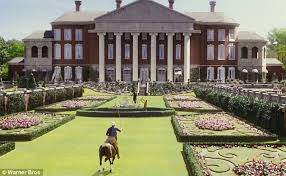 Gatsby's mansion is another great feature of his parties. Not only is it huge, but its beauty drawls you in. It’s as if you can't walk away from it. Perhaps this is the reason people keep coming back to these parties. It’s important to understand the type of people who come to these parties. All kinds of people. Drunk, wealthy, and elegant people. Wealthy women with pearl necklaces and men with tuxedos surround this big mansion. There is dancing and music played throughout the party. Mr. Nick Carraway says "By seven o'clock the orchestra has arrived, no thin five piece affair, but a whole pitiful of oboes and trombones and saxophones and viols and cornets and piccolos and low high drums." It creates a high energy to the party, and it wouldn't be the same without it. We have all been to a great party, but Gatsby’s party is unlike any other. It is hard to imagine how great a party like this is. You have to see it for yourself. 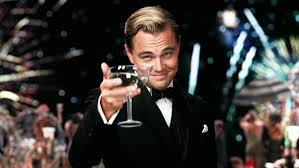 The people, dancing, music, alcohol, and wealth are what make Jay Gatsby's so great. 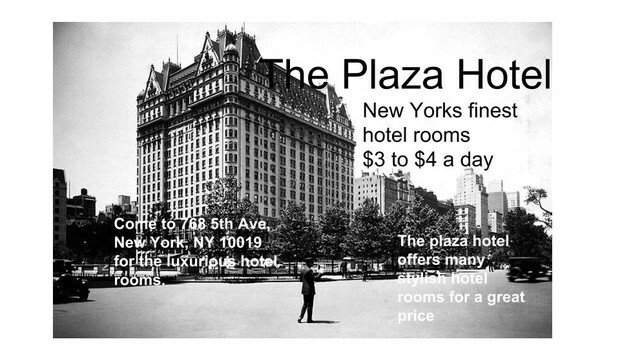 Don't miss out on the opportunity to stay at the finest, most luxurious hotel in New York city. Prohibition has become the big talk around the country. It's supposed to reduce the amount of crime, lower taxes, and reduce social issues. But why is prohibition suddenly becoming a big issue? People are taking matters into their own hands by deciding to make bootleg alcohol. Pretty smart of them right? Except the fact that because of the bootleg alcohol people are getting alcohol poisoning leading to the deaths of many people. Rumors have spread that even politicians have admitted to drinking bootleg alcohol, which isn't a big surprise. 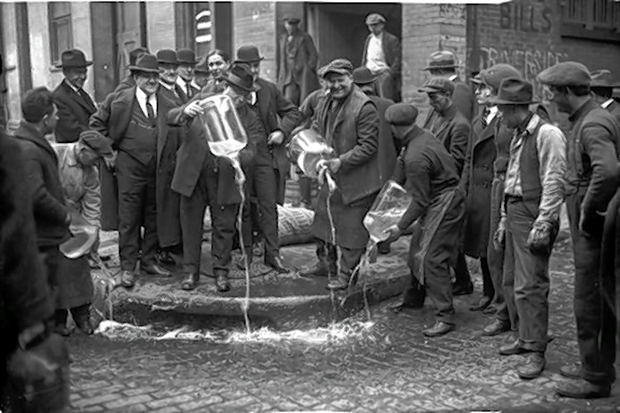 Most people who drank alcohol before this prohibition are drinking the bootleg alcohol now. Some wine is still available in the U.S, but it can only be transported through government warehouses. This wine was only for religious ceremonies. So I guess that sums it up folks. There is still much more to come during these prohibition days. Who knows what could happen. There is one thing we know for sure, no one is going to let a silly prohibition get in the way of their alcohol drinking. In the run down side of town known as the Valley of Ashes, People are gathered around in memory of Myrtle Wilson. Myrtle was a bold woman who everyone seemed to love dearly, especially her husband, George Wilson. George was the owner of the auto shop that many people went too. The night of Myrtle’s death was a very sad and confusing night. Lots of rumors were spread about what happened to her, but the real story was leaked from an witness who saw everything. The witness was a man who owned a coffee shop near by. He was walking near Myrtle and George’s home and heard tons of commotion. The witness says he heard Myrtle saying "Throw me down and beat me you little coward!" He looked up and through the window saw George abusing his wife terribly. The man could see how scared Myrtle was and he saw how hard she tried to get away. Eventually he saw Myrtle break away and as she rushed out towards the street an expensive bright yellow car came speeding down the road. The man said Myrtle rushed out toward the car like she knew who was in it and wanted them to stop. All of sudden the whole town heard a huge bang and rushed outside their homes to see Myrtle lying breathlessly on the road and a nice yellow car speeding off in the distance. 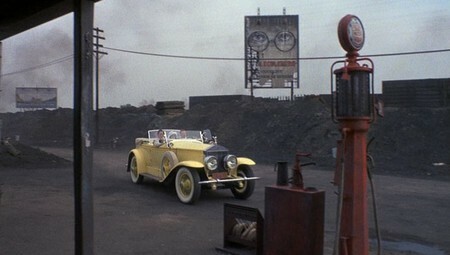 It was said that Gatsby was the owner of the car but the witness could have sworn he didn’t see a man driving. Many questions still linger around the Valley of Ashes like why didn’t Gatsby stop?, did he know Myrtle?, was this who Myrtle supposedly had a affair with? Unfortunately it seems we will never know the answers to these questions, but someone somewhere does know the truth to this tragic story. 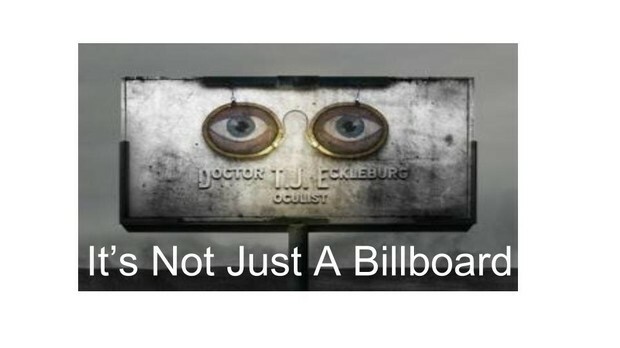 The eyes of Dr. T.J. Eckleburg, a gigantic billboard that some New Yorkers adore and some New Yorkers believe is just a billboard. The eyes look down on the town, the Valley of Ashes as a symbol of God. Its a fantastic billboard, its one of New York's biggest attractions and many tourist come to visit the billboard. George Wilson talks to Michaelis about when he discovers Myrtle’s affair and he says, " And I said 'God knows what you’ve been doing, everything you’ve been doing. You may fool me, but you can’t fool God! '” However, Michaelis tries to point out to him that “It’s just a billboard.” This just shows how differently people view this billboard. Tourist should come visit this and think about how they view the billboard. Today New York mourns the death of Jay Gatsby. Gatsby was one of the towns most famous financier, entrepreneur, and business man. His death was tragic, appears to be a simple case of mistaken identity. George Wilson shot Gatsby at his residence before taking his own life. George believed that Gatsby killed his wife in a car accident. Gatsby was a young man, who came from a poor family in North Dakota. Gatsby worked all his life to gain wealth. Rumor has it that he did this to impress Daisy Buchanan whom he secretly loved. Gatsby had few friends but people were always around him. One of his friends, Mr. Nick Carraway said “I believed that on the first night I went to Gatsby’s house I was one of the few guests who had actually been invited. People were not invited--they went there.” This tragic death was a surprise to everyone, Jay Gatsby will always be remembered. Welcome to your local Wilson Garage. We’re have for you, whether it’s time for auto repairs, gas. new tires, or if you have any questions about how to keep your car running newer and longer. The garage is located near New York in a place we like to call the Valley of Ashes.